Visit Run Green online at RunGreen.com for lots of John Deere products. Owned and operated by a John Deere dealer in the midwest, they believe in treating their customers right. Run Green has been built on good products, great employees, top-notch service and competitive prices. 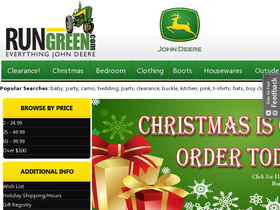 At RunGreen you'll find John Deere hats, sweatshirts, baby clothes, boots, jackets, watches, gloves and much, much more. Visit 58Coupons.com for all the best ways to save with RunGreen discounts, RunGreen promotions, RunGreen deals and RunGreen coupons when shopping at RunGreen.com. Shop the Clearance section at RunGreen.com to save up to 80% on select items. Click link to view the selection. RunGreen.com is offering flat rate shipping on orders over $50 for a limited time only. Click link for details. Use this coupon from RunGreen.com to get 5% off your order. Click link to see code and shop. This 4 piece set from RunGreen.com is perfect for little tractor operators everywhere. Click link to view details.